Funny how each professional field has their own set of acronyms. I am willing to bet that most readers of this column were able to discern those three listed and identify with them. I will expound further on all three. This (World Agricultural Supply and Demand Estimates) was a “good” report for animal ag, not so great for the agronomic sector. Let’s set the stage for this one. First, the bump in soybean yields is projected to result in world soybean ending stocks at 105 million metric tons. This would be the largest carryout ever. With or without tariffs, soy prices were going to be under pressure. You will likely not read that in magazines or articles targeted at the grain production community, but the numbers are undeniable. 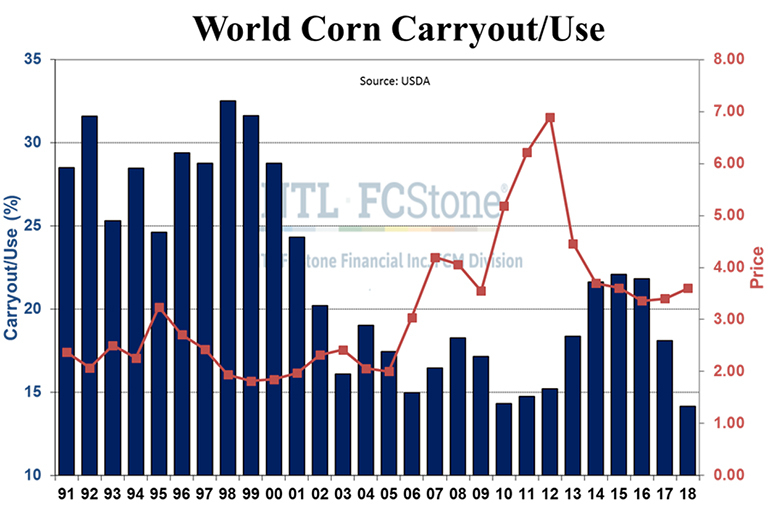 U.S. ending stocks at over 700 million bushels are a record in absolute terms and the second-highest as a percentage of carryout to usage. This is not a bullish environment by any stretch of the imagination. Toss in a tough trade environment and you have a recipe for low prices to perpetuate for a bit. How low? December soybean meal looks like it wants to test technical resistance in the $320 area. If that is breached there is little support until the $300 area. Combine this with wide basis and you have some salve for a brutal hog market in the form of cheaper feed costs. Corn is a more interesting animal. There is a huge discrepancy between what is going on in the United States relative to the rest of the world. I am just back from a Brazilian trip where we met with several pork producers from that country. They are losing money, too, and do not have access to a plentiful corn crop to help ease the pain. Their corn crop is getting revised downward while our production moves higher. 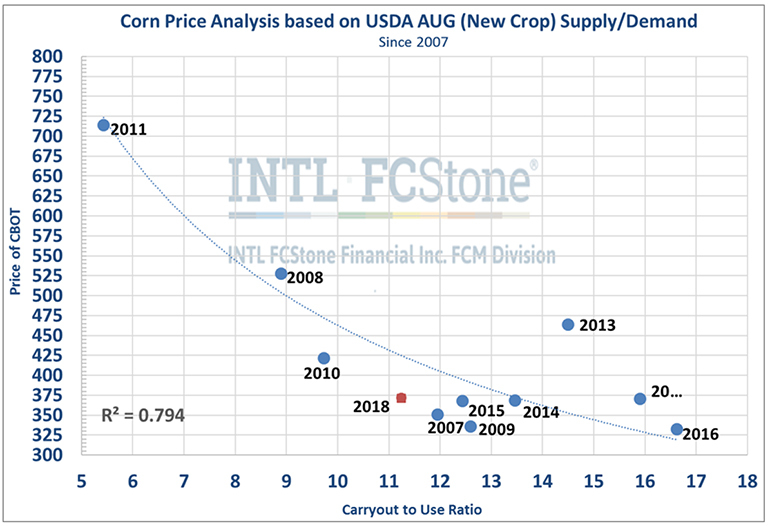 I think the USDA corn yield at 178.4 is not likely to move much in subsequent reports. Ear counts were big which accounted for the bulk of the increased production estimate. It will be tough for ear weights to move much higher than the USDA has projected so I do not see a lot of wiggle room from here on out. Here is the difference between the corn and soy markets. The soy production increase fell largely to the bottom line carryout. Of the 350ish million bushels added to the corn balance sheet, only 130 went to ending stocks. Bottom line: we have world demand for corn whereas the soy market is saturated. World corn stocks were higher relative to the July numbers but still on the lower end of historical values (see the chart below). Here is your take-home from the grain report: Stocks of feedstuffs — corn, wheat, milo, etc. — across the world continue to shrink leaving the United States with the most abundant and cheapest feed available. In second place is last year’s Russian wheat crop. U.S. corn exports have the potential to move higher if the logistics at the Gulf can handle the volume. Do not fall asleep at the wheel regarding corn coverage; this break in price is your friend and we should probably be looking to add to ownership if we approach the July lows. • These are the first reported outbreaks in East Asia, a region with nearly half of the global population and half of the world’s pigs. • China has wild pigs/boars. This is the main vector of ASF due to the fact that wild hogs do not bear the symptoms but can carry and spread the virus. This is the main vector of ASF spread in Europe and suggests that a wild pig problem is a serious risk in China. 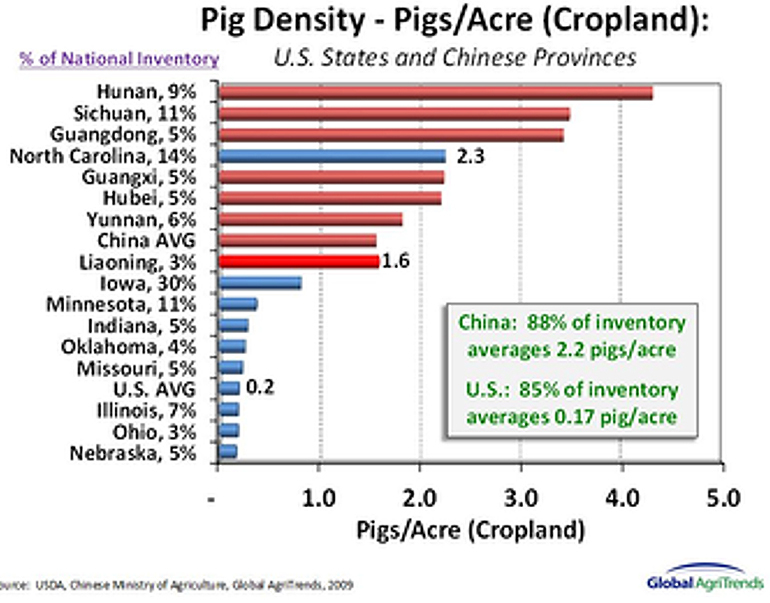 •The density of hogs in China’s arable land mass (excluding non-arable deserts and mountains) calculates to 1.6 pigs per acre. That is higher density than any U.S. state excluding North Carolina (2.3 pigs per acre of cropland) and twice as dense as Iowa (0.8 pigs per acre of cropland). • Unlike foot-and-mouth disease which just sickens animals who then recover (productivity losses), ASF kills pigs fast. The long-term damage from spreading ASF in China is staggering. Pork consumption accounts for 74% of all meat and poultry consumption among China’s 1.4 billion. And while population rates are not rising, wealth is. We will be watching this one closely as it has all the makings to repeat the volatility we experienced during the porcine epidemic diarrhea era in 2014. Buckle up. Contact us if you want more explanation on this one, I have more ideas than room to share in this forum. • On Aug. 8, a few Christensen Farms locations, including the home office in Sleepy Eye, Minn., were visited by authorities. The purpose of these visits was to collect information regarding a specific, third-party vendor who provided the company with power-washing services. • While onsite, the authorities also verified CF employees have the legal right to work within the United States. • Christensen Farms was not named in the indictment that generated this investigation, but was named in a search warrant along with more than 10 other parties in three states. • To date, no issues were found relating to Christensen Farms’ employees or employment practices, and none of its employees were arrested. In all operations in the United States, independent contractors are required to comply with immigration and workplace compliance laws. The grandiose nature of journalism sometimes gets in front of The Truth and can lead readers to imply that something nefarious is occurring instead of allowing facts to dictate the pace of law enforcement. Let’s stay objective on this (and every?) topic.